When many restaurants are looking to shrink their footprint, Glaze wants to get bigger. The eight-unit chain has not only increased the square footage in its New York City flagship location, but also plans to stick with the larger size in new units. “Our first location was tiny, and we never imagined doing the revenue that we started to do over the last seven years and what we found was that it was just too small,” said Glaze founder Paul Krug. 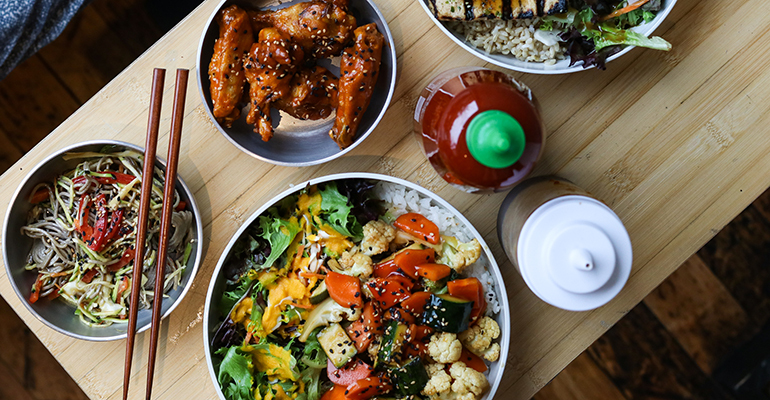 An Asian fast-casual chain focusing on healthy offerings, Glaze is a teriyaki concept with house-made sauces making bowls and salads with organic and free-range proteins. The new larger prototype, located across street from the first Glaze in Midtown East, is 1,500 square feet — more than twice the area of the since-closed 650 square-foot location. “It got to the point where if I worked nearby I wouldn’t want to go eat inside a Glaze during lunch…. and we felt like it was critical to have a bigger footprint to accommodate our customers better,” said Krug. Glaze plans to use the added square footage to make more room for dine in and to-go orders. 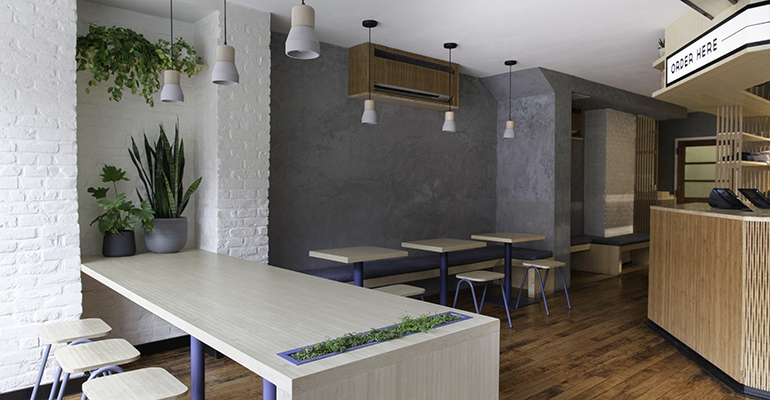 Designed by the Williamsburg-based studio, Sweatshop, the new prototype is intended to have an all-day café atmosphere where customers can linger after a meal. Tables, both low and high top, are scattered throughout the space to allow for different dining experiences along with small niches dedicated to comfort. The grab-and-go area is clearly separated from the dining area now to make pick-up meals easier and sit-down meals more comfortable. “We have a whole dedicated area for your pick up, your grab and go…so that the people that are dining in aren’t being bumped into and hassled and people who are picking up have a nicer area to wait,” said Krug. On the menu side of things, the location debuts a sauce bar for mixing and matching sauces for bowls and salads. Previously, each additional sauce was $1 extra, and the restaurant says the bar is intended to allow customers to “play around” with the flavors in their dishes. Sauces in this bar will include the house-made gluten-free teriyaki and hot sauce, soon to be joined by a housemade sugar-free teriyaki sauce, what Glaze claims is the first of its kind in the U.S. Krug hopes to entirely remove processed sugar from the menu within the next few years. “One of the main reasons [sauce costs more] was because, other than the additional ingredients and cost to it, was in Seattle where I’m from and the roots of what we’re doing that’s what they did. I think that it’s gotten in the way of things,” said Krug. The most popular item on the menu remains the chicken with traditional sauce but the pricier proteins — salmon and steak — are becoming more popular. Krug says the upscale design makes customers more comfortable ordering these items. However, he noted that it’s a priority to keep menu costs reasonable. Glaze’s prices fall in the range of other fast-casual brands. Currently Glaze has locations in Chicago, San Francisco, New York and Madison, Wisc.